Cale Makar was the fourth overall pick by Colorado in the 2017 draft and recently won the Hobey Baker Memorial Award as college hockey’s top player. Cale Makar is about to jump from one gruelling playoff run straight into another. Makar, who’s from Calgary, could make his NHL debut on Monday in Game 3 of a playoff series against the Flames. On Saturday night, Nathan MacKinnon scored 8 minutes 27 seconds into overtime and the Avalanche tied their first-round series with the Flames 1-1. The six-foot, 192-pound Makar was the fourth overall pick by Colorado in the 2017 draft. 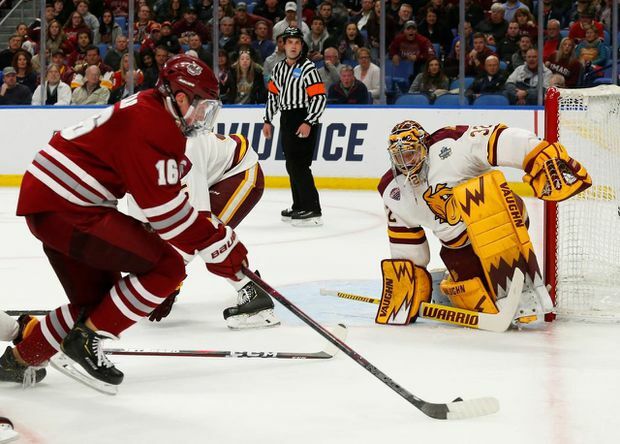 Makar recently won the Hobey Baker Memorial Award as college hockey’s top player after a season in which he had 49 points, including 16 goals, over 41 games. Makar joins an Avalanche blue line that includes Tyson Barrie, Ian Cole, Samuel Girard, Erik Johnson and Nikita Zadorov. Girard was banged up in Saturday’s overtime win and will undergo further evaluation before a decision is made on his status.